Recently, the number of available disease-modifying therapies for treatment of relapsing-remitting MS (RRMS) has increased.1,2 However, many patients treated with these agents continue to experience relapses and disease progression3,–,5; thus, new treatment options are still required. One strategy may be to use combinations of effective agents to suppress MS disease activity more effectively. Cladribine, a synthetic deoxyadenosine analog that acts in peripheral tissues, enters the CNS and is taken up by lymphocytes and phosphorylated by deoxycytidine kinase, resulting in targeted and sustained reductions of the T and B lymphocytes that are implicated in the pathogenesis of MS.6 In the Phase III CLARITY study treatment with cladribine tablets (Mavenclad; Merck Serono Europe Ltd, London, UK) given in short courses annually for 2 years significantly improved clinical and MRI outcomes.7 Lymphopenia was the most commonly reported adverse event (AE).8 In CLARITY Extension, the clinical benefits of 2-year of treatment with cladribine tablets were shown to be durable, without further active treatment.9 In the ORACLE-MS study, cladribine tablets significantly reduced the risk of clinically definite MS in patients with a first clinical demyelinating event compared with placebo.10 The dosing regimen of cladribine tablets offers a unique posology, which provides patients with significant treatment-free periods. Thus, assessment of the safety and potential benefits of treatment with cladribine tablets in patients experiencing relapses and disease progression while on interferon (IFN)-β therapy is of interest. Here, results from the ONWARD (Oral cladribine added oN to IFN-β in patients With Active Relapsing Disease) study are reported. Primary research question: what are the effects of adding cladribine tablets 3.5 mg/kg to IFN-β in patients still experiencing active relapsing MS despite IFN-β treatment? This study provides Class I evidence that for patients with active relapsing MS despite IFN-β treatment, cladribine tablets added to IFN-β reduced relapses and MRI lesion activity over 96 weeks and increased the incidence of lymphopenia. 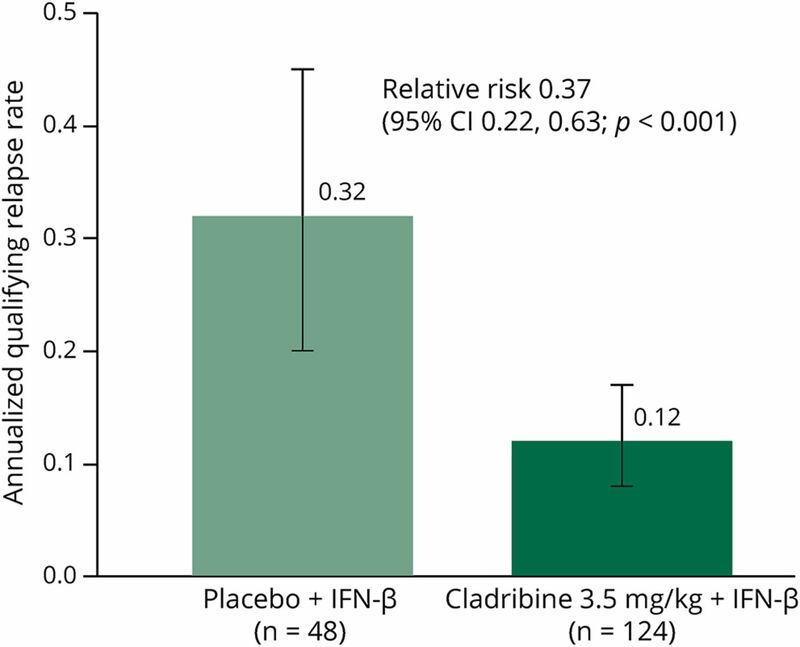 Patients treated with cladribine 3.5 mg/kg/IFN-β were 63% less likely to have a qualifying relapse than placebo/IFN-β recipients (relative risk [95% CI] 0.37 [0.22–0.63], p = 0.001). The cladribine 3.5 mg/kg/IFN-β group was 90% less likely to have a new T1 Gd+ lesion (relative risk 0.10 [0.03–0.37], p < 0.001). There was an increased incidence of lymphopenia reported as an AE for cladribine/IFN-β recipients (40.3% vs 0% of placebo/IFN-β recipients). ONWARD (NCT00436826) was a 96-week, randomized, double-blind, phase IIb study conducted between November 2006 and March 2012 at 50 centers: United States (25 sites), Russia (10), Spain (9), and Italy (6). The study was conducted in accordance with the Declaration of Helsinki, International Conference on Harmonisation/Good Clinical Practice Guidelines, and local regulations. An independent ethics committee approved the study, and all patients provided written informed consent. Under the original study protocol, 2 cumulative doses of cladribine tablets (3.5 and 5.25 mg/kg) added to existing IFN-β therapy were to be evaluated. Following a signal related to lymphopenia with cladribine 5.25 mg/kg/IFN-β (15/17 [88.2%] patients had grade 3/4 lymphopenia), this dose was discontinued and patients already randomized continued in the trial but received IFN-β only and were followed up for safety. A summary of protocol changes is shown in table e-1 (links.lww.com/NXI/A54). Under an amended protocol (figure e-1, links.lww.com/NXI/A52), patients were to be randomized (2:1) to cladribine 3.5 mg/kg/IFN-β or placebo/IFN-β. Randomization was stratified by site and IFN-β agent, which led to an actual randomization of 2.6:1 for cladribine 3.5 mg/kg/IFN-β to placebo/IFN-β. A central interactive voice response system was used to allocate patients using a computer-generated treatment randomization code and treatment groups were assigned with a block size of 6. The study included an open-label extension (cladribine tablets 3.5 mg/kg plus IFN-β) or a 48-week safety follow-up (IFN-β only), although limited data are available from this period because of discontinuation of the study extension by the sponsor. All patients were offered enrollment into the PREMIERE Registry (NCT01013350) for long-term safety follow-up. Depending on bodyweight, patients took cladribine 10 mg tablets (or matching placebo) in short courses annually to achieve a cumulative dose of 3.5 mg/kg. To maintain blinding, all patients within 10 kg weight ranges received the same number of tablets (cladribine or matched placebo). All available forms of IFN-β were permitted: IFN-β-1a, 44 μg SC 3 times a week; IFN-β-1a, 30 μg IM once weekly; or IFN-β-1b, 250 μg SC every other day. Patients aged 18–65 years were eligible for study entry if they fulfilled the following criteria: RRMS or secondary progressive MS (SPMS) with relapses (2005 McDonald criteria)11; treatment with IFN-β for ≥48 consecutive weeks before screening with ≥ 1 MS relapse during that period; clinical stability (other than relapses) during the 28 days before screening; an Expanded Disability Status Scale (EDSS) score of 1.0–5.5; and normal hematologic parameters within 28 days of baseline (day 1 of randomization). Normal hematologic parameters were defined as: platelets, 140–450 × 103/μL; absolute neutrophil count (ANC), 2.03–8.36 × 103/μL; absolute lymphocyte count, 1.02–3.36 × 103/μL; white blood cell (WBC) count, 4.1–12.3 × 103/μL; and hemoglobin, 11.6–16.2 g/dL. Switching from one IFN-β therapy to another was permitted in the 48 weeks preceding screening if the patient had been on a stable regimen of the current IFN-β ≥3 months before screening. Selected exclusion criteria are described in table e-2 (links.lww.com/NXI/A54). Patients could only receive double-blind treatment in the second 48-week study period if all hematologic parameters were ≥ the lower limit of Common Terminology Criteria for Adverse Events (CTCAE) grade 1 toxicity at week 44. Treating physicians supervised study drug administration and the recording and treatment of AEs and MS relapses, and independent, evaluating physicians assessed neurologic findings and relapses (each blinded to treatment group assignment). MRI scans were evaluated at a central neuroradiology center (blinded to treatment). Neurologic examinations were conducted at screening, day 1 and weeks 13, 24, 36, 48, 60, 72, 84, 92, and 96 (or early termination). MRI scans were performed at day 1 and weeks 24, 48, 72, and 96 (or early termination). The primary outcome was safety and tolerability of cladribine tablets added to IFN-β therapy. Particular attention was given to AEs and laboratory toxicities known to be associated with the use of cladribine or of potential concern because of its mechanism of action. The primary safety variables were treatment-emergent AEs in the system organ class (SOC) infections and infestations; the incidence of treatment emergent AEs and serious AEs (SAEs), including neoplasms; CTCAE grade 3 or 4 severity toxicity on hematology and liver function parameters (lymphocytes, hemoglobin level, WBC, ANC, platelets, CD4 cell count, alanine transaminase, aspartate transaminase, and bilirubin); time to first grade 3/4 hematologic or liver toxicity; time to recovery from grade 3/4 hematologic or liver toxicity (defined as time to return to grade 0/1), and lymphocyte counts. Efficacy evaluations (secondary objectives) included the number of qualifying relapses over 96 weeks; time to first qualifying relapse; mean numbers of new gadolinium-enhancing (Gd+) T1, active T2, and combined unique active (CUA) lesions (defined as new Gd+ T1, or new or enlarging T2 lesions, or both, without double counting) on MRI scans at 96 weeks; and time to confirmed 3-month EDSS progression. A qualifying relapse was defined as a 2-grade increase in ≥1 or a 1-grade increase in ≥2 Kurtzke Functional systems,12 excluding bowel/bladder or cognition changes, in the absence of fever lasting ≥24 hours and preceded by ≥ 30 days of clinical stability or improvement. Confirmed EDSS progression was defined as an increase in the EDSS score of ≥1.5, ≥1.0, or ≥0.5 units if the score at baseline was 0, ≥0.5, and ≤4.5, or ≥5.0, respectively, confirmed at ≥3 months. The double-blind period safety population included all patients who had received ≥1 dose of study medication and for whom follow-up safety data were available. The primary safety analysis was performed on the proportion of patients developing a treatment-emergent AE in SOC Infections and Infestations and the proportion of patients developing grade 3 or 4 toxicity on hematology and liver function parameters. Time to first grade 3/4 hematologic or liver toxicities were estimated using the Kaplan-Meier method. Descriptive statistics were provided for all safety data. Patients were analyzed for efficacy over the double-blind period. All efficacy analyses were exploratory because the study was not powered to detect between-group differences for any end point, and all p values less than 0.05 are considered as nominally significant. Despite the primary objective being safety and tolerability of cladribine, a sample size estimation for the main efficacy parameter was performed. A sample size of 132 was required to provide 80% power to detect difference in the mean changes from baseline in the number of Gd+ T1 lesions between the add-on cladribine group vs placebo, with a significance level of 5.0%. For all new products or new indications approved in both the European Union and the United States after January 1, 2014, Merck KGaA will share patient level, study level data after deidentification, as well as redacted study protocols and clinical study reports from clinical trials in patients. These data will be shared with qualified scientific and medical researchers, upon researcher's request, as necessary for conducting legitimate research. Such requests must be submitted in writing to the company's data sharing portal and will be internally reviewed regarding criteria for researcher qualifications and legitimacy of the research purpose. One hundred seventy-two patients were randomized and analyzed for safety and efficacy in the double-blind period. Forty-two patients were randomized under the original protocol and analyzed separately for safety in the double-blind period. The results of the study under the amended protocol are the primary subject of this report, unless otherwise stated. Safety data from the original protocol are included in tables where indicated. Patient demographics and baseline characteristics are presented in table 1, and figure 1 shows patient disposition. The number of patients using the different types of IFN-β in combination with cladribine tablets 3.5 mg/kg was as follows: IFN-β-1a 44 μg for SC use 3 times a week (Rebif; n = 82), IFN-β-1a 30 μg for IM use once weekly (Avonex; n = 30), and IFN-β-1b 250 μg for SC use every other day (Betaseron/Betaferon; n = 60). Comparisons of baseline EDSS and MRI assessment and the proportions of who developed a CTCAE grade 3 or 4 lymphocyte decrease by IFN-β treatment and treatment group are not presented because of the low numbers of patients in each group. AE = adverse event; IFN = interferon. In the per protocol population, more than 50% of patients in both treatment groups had an AE categorized as an infection or infestation, with a slightly higher incidence in patients receiving cladribine/IFN-β vs placebo/IFN-β (table 2). Fifty of 124 (40.3%) cladribine/IFN-β recipients vs 0% of placebo/IFN-β recipients reported lymphopenia as an AE. Four SAEs of infection or infestation were reported. Two SAEs of infection or infestation were reported in the original protocol population. All SAEs of infection or infestation occurred in patients treated with cladribine/IFN-β. Few opportunistic infections were observed. Seven patients who were treated according to the amended protocol had herpes zoster, with all occurrences seen in patients treated with cladribine 3.5 mg/kg/IFN-β. In the original protocol population, there was 1 occurrence of herpes zoster in a patient treated with cladribine 5.25 mg/kg/IFN-β. Three additional occurrences were reported; 1 during the open-label extension and 2 during the safety follow-up in the cladribine 3.5 mg/kg/IFN-β group (not shown). No malignancies were reported in patients enrolled under the amended protocol (all events reported in the SOC benign, malignant, or unspecified neoplasms were recorded as SAEs). Squamous cell carcinoma of the skin occurred in a 54-year-old female patient who received cladribine 3.5 mg/kg/IFN-β in the original protocol (table 2). This developed approximately 2 years after starting cladribine/IFN-β and 7 years after starting IFN-β. AEs were similar across the 2 groups, except for higher incidence of lymphopenia seen with cladribine 3.5 mg/kg/IFN-β (table 3 and table e-3, links.lww.com/NXI/A54 for the original protocol). A higher incidence of grade 3/4 toxicities for numbers of lymphocytes, CD4 cells, neutrophils, and WBCs occurred with cladribine/IFN-β relative to placebo/IFN-β (table 4 and table e-4, links.lww.com/NXI/A54 for the original protocol). In the cladribine 3.5 mg/kg/IFN-β cohort, time to grade 3/4 lymphocyte toxicity was shortest and time to recovery was longest compared with the other toxicities (table 4). The mean (SD) time to recovery (from grade 3/4; <500 cells/mm3 to grade 0/1; >800 cells/mm3) was 142.5 (109.9) days for cladribine/IFN-β recipients. Of the 79 patients who developed grade 3/4 lymphopenia in the cladribine 3.5 mg/kg/IFN-β group, 77 were grade 3 and 2 were grade 4. The profile of lymphocyte counts is shown in figure e-2 (links.lww.com/NXI/A53). Median lymphocyte counts remained stable in the placebo/IFN-β group over 96 weeks. There were low or zero incidences of grade 3/4 toxicities related to hemoglobin, liver transaminases, platelets, or bilirubin in both groups (table 4). Pregnancy outcomes are shown in table e-5 (links.lww.com/NXI/A54). During the double-blind period, 4 patients and 2 partners of patients became pregnant. Among the 3 placebo/IFN-β group patients who became pregnant, 1 elected an induced abortion, 1 experienced a spontaneous abortion, and 1 delivered a healthy child. The fourth patient was in the cladribine 3.5 mg/kg/IFN-β group and experienced a spontaneous abortion. Both men whose partners became pregnant were in the cladribine 3.5 mg/kg/IFN-β group. One pregnancy resulted in a healthy child; the outcome of the second pregnancy is unknown. The annualized qualifying relapse rate was significantly lower in patients treated with cladribine 3.5 mg/kg/IFN-β, and these patients were 63% less likely to have a qualifying relapse than placebo/IFN-β recipients (relative risk of 0.37 [95% CI: 0.22–0.63], p = 0.001; figure 2). There was a significant reduction in the number of new T1 Gd+ lesions during the double-blind period in the cladribine 3.5 mg/kg/IFN-β group (mean [SD] 0.25 [1.46]) compared with the placebo/IFN-β group (1.27 [3.39]). The cladribine 3.5 mg/kg/IFN-β group was 90% less likely to have a new T1 Gd+ lesion and 59% less likely to have a CUA lesion compared with the placebo/IFN-β group (table e-6, links.lww.com/NXI/A54). The proportion of patients experiencing a first qualifying relapse was lower with cladribine/IFN-β (23/124; 18.5%) vs placebo/IFN-β (16/48; 33.3%); however, the survival curves crossed, violating the assumption of constant hazards so the result should be interpreted with caution. The proportion of patients with confirmed EDSS progression over 96 weeks was similar for cladribine 3.5 mg/kg/IFN-β (19/124; 15.3%) vs placebo/IFN-β (6/48; 12.5%). A post hoc analysis of key outcomes in subgroups of the intent-to-treat (ITT) population classified as SPMS or RRMS demonstrated the efficacy of cladribine 3.5 mg/kg/IFN-β in both subgroups and is shown in supplemental information. The ITT population included 26 patients with SPMS and 171 patients with RRMS. The distribution of patients by treatment groups is presented in table e-7 (links.lww.com/NXI/A54), together with demographic and clinical characteristics at baseline for both the SPMS and the RRMS subgroups. In the SPMS subgroup, cladribine 3.5 mg/kg/IFN-β demonstrated an 89% reduction in the annualized qualifying relapse rate compared with placebo (relative risk ratio of 0.11 [95% CI 0.01–0.94]). The relative risk ratio in the cladribine 3.5 mg/kg/IFN-β over the placebo group in the RRMS subgroup was 0.50, with a 95% CI ranging from 0.30 to 0.84 (table e-8, links.lww.com/NXI/A54 for clinical and MRI outcomes in these subgroups). IFN-β therapy has been associated with hematologic changes, including lymphopenia,21,22 and it seems probable that the use of IFN-β concurrently with cladribine tablets in the ONWARD study is the most likely factor leading to the higher incidence of lymphopenia, with longer time to recovery expected for the combination than seen with cladribine tablets alone. Disease duration for the patients in this study was relatively long compared with typical RRMS studies, including the CLARITY study. This is because the inclusion criteria required previous experience with a DMD for all patients and allowed the entry of patients with SPMS. However, the population recruited to the study is considered to have less influence on the incidence of lymphopenia reported with this combination than the effects of each drug on lymphocytes. Infections or infestations were only slightly more frequent with cladribine/IFN-β, and, unlike the SENTINEL study,13 no unexpected opportunistic infections were reported. As in the CLARITY study, herpes zoster was reported in a small number of patients treated with cladribine/IFN-β, and this may be related to cladribine treatment.8 Treatment with cladribine 3.5 mg/kg/IFN-β did not result in an increase of malignancy or unspecified tumors compared with treatment with placebo/IFN-β. One case of cutaneous squamous cell carcinoma reported in the original protocol was the only malignancy reported in patients who were treated with cladribine 3.5 mg/kg/IFN-β. The study was designed by the members of the steering committee (X. Montalban, T.P. Leist, B.A. Cohen, and H. Moses) and the study sponsor. The sponsor collected the data, performed the analysis, and was involved in data interpretation. The data were available to all authors, and authors contributed to data analysis and interpretation. The steering committee was responsible for the final decision to submit the manuscript for publication. Supported by Merck Serono SA Geneva, Switzerland, a subsidiary of Merck KGaA, Darmstadt, Germany. X. Montalban served on the scientific advisory board of Actelion, Bayer, Biogen, Merck, Novartis, Oryzon Genomics, Receptos, Roche, Sanofi Genzyme, and Teva; received travel funding from Biogen, Celgene, Merck, Novartis, Roche, Sanofi, and Teva; served on the editorial board of Multiple Sclerosis Journal, Journal of Neurology, The International MS Journal, Revista de Neurologia, and Therapeutic Advances in Neurological Disorders; consulted for Actelion, Bayer, Biogen, Merck, Novartis, Oryzon Genomics, Receptos, Roche, Sanofi Genzyme, and Teva; and received research support from the Multiple Sclerosis Foundation of Barcelona and Fundacio Cemcat. T.P. Leist served on the scientific advisory board of Novartis, Genzyme, Genentech, EMD Serono, Actelion, Biogen, and Bayer; received travel funding and/or speaker honoraria from Novartis, Genzyme, Genentech, Biogen, Bayer, and Teva; served on the editorial board of Practical Neurology and Frontiers in Neurology; consulted for Novartis, Genzyme, Genentech, EMD Serono, Actelion, Biogen, and Bayer; served on the speakers bureau of Novartis, Genzyme, Genentech, Biogen, and Teva; is on the board of the MSBase Foundation; and received research support from Novartis, Genzyme, Actelion, Biogen, Chugai, and Alkermes. B.A. Cohen consulted for Acorda, EMD Serono, Genentech, Questcor, Teva, Astellas, Biogen, and Mylan and received research support from Biogen, Novartis, Hoffman La Roche, EMD Serono, and MedDay. H. Moses consulted for Teva, Biogen, EMD Serono, Genzyme, Genentech, and Bayer; served on the speakers bureau of Teva, Biogen, and EMD Serono; and received research support from Teva, Novartis, MedDay, Genzyme, and Genentech. J. Campell is employed by inScience Communications. C. Hicking is employed by Merck KGaA. F. Dangond is employed by EMD Serono. Full disclosure form information provided by the authors is available with the full text of this article at Neurology.org/NN. The authors thank patients and their families; all the ONWARD study investigators (see materials, links.lww.com/NXI/A54 for the list of ONWARD trial principal investigators, by country); Bettina Stubinski (previously of Merck Serono SA Geneva, Switzerland, a subsidiary of Merck KGaA, Darmstadt, Germany) for coordination of the study; and Nathalie Lachenal (previously of Merck Serono SA Geneva, Switzerland) for monitoring and assessing safety data.
. Update on disease-modifying treatments for multiple sclerosis. Clin Ther 2014;36:1938–1945.
. Multiple sclerosis: current and emerging disease-modifying therapies and treatment strategies. Mayo Clinic Proc 2014;89:225–240.
. The effect of disease modifying therapies on disease progression in patients with relapsing-remitting multiple sclerosis: a systematic review and meta-analysis. PLoS One 2015;10:e0144538.
. A network meta-analysis of randomized controlled trials for comparing the effectiveness and safety profile of treatments with marketing authorization for relapsing multiple sclerosis. J Clin Pharm Ther 2013;38:433–439.
. Immunomodulators and immunosuppressants for relapsing-remitting multiple sclerosis: a network meta-analysis. Cochrane Database Syst Rev 2015:Cd011381.
. Cladribine: mode of action and implications for treatment of multiple sclerosis. Clin Neuropharmacol 2011;34:28–35.
. Safety and tolerability of cladribine tablets in multiple sclerosis: the CLARITY (CLAdRIbine tablets treating multiple sclerosis orallY) study. 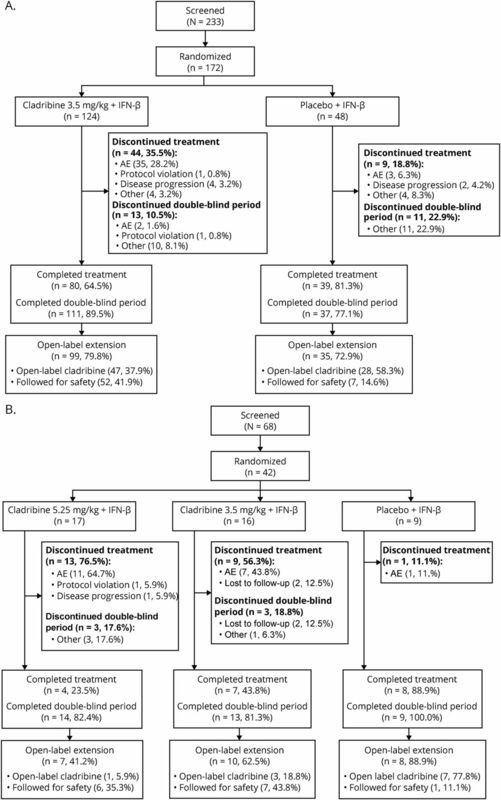 Mult Scler 2011;17:578–593.
. Safety and efficacy of cladribine tablets in patients with relapsing-remitting multiple sclerosis: results from the randomized extension trial of the CLARITY study. Mult Scler Epub 2017 Aug 1. doi: 10.1177/1352458517727603.
. Effect of oral cladribine on time to conversion to clinically definite multiple sclerosis in patients with a first demyelinating event (ORACLE MS): a phase 3 randomised trial. Lancet Neurol 2014;13:257–267.
. Natalizumab plus interferon beta-1a for relapsing multiple sclerosis. New Engl J Med 2006;354:911–923.
. Teriflunomide added to interferon-beta in relapsing multiple sclerosis: a randomized phase II trial. Neurology 2012;78:1877–1885.
. Results of the avonex combination trial (ACT) in relapsing-remitting MS. Neurology 2009;72:535–541.
. Combination therapy in multiple sclerosis. Lancet Neurol 2010;9:299–308.
. Atorvastatin added to interferon beta for relapsing multiple sclerosis: a randomized controlled trial. J Neurol 2012;259:2401–2413.
. Randomized study combining interferon and glatiramer acetate in multiple sclerosis. Ann Neurol 2013;73:327–340.
. Managing adverse effects of disease-modifying agents used for treatment of multiple sclerosis. Curr Med Res Opin 2008;24:2679–2690. MAVENCLAD® EPAR 22 June 2017. Available at: ema.europa.eu/docs/en_GB/document_library/EPAR_-_Public_assessment_report/human/004230/WC500234563.pdf. Accessed March 16, 2018.
. Interferon-beta-1b: a review of its use in multiple sclerosis. CNS Drugs 2011;25:67–88.
. Haematological effects of interferon-beta-1a (Rebif) therapy in multiple sclerosis. Drug Saf 2004;27:745–756. Mavenclad EU SmPC. Available at: medicines.org.uk/emc/medicine/34044. Accessed January 12, 2018.